The “season” kicks off with Green Beer Sunday and continues throughout March. The celebrating really revs up on the Sunday before the big parade at the “Parade Week Kick Off Party.” And from there, it’s full steam ahead with events leading up to the parade and through March 17th. Listen, there’s a lot going on. But don’t worry, your buddy Winter is here to give you the inside scoop, so you won’t miss any of the parties. Starting at 9:30 a.m., parade organizers paint a green stripe on the road indicating the next day’s parade route. Move over traffic- St. Patrick is coming through. That evening head to the Marriott Syracuse Downtown for the Grand Marshal Gala Celebration Dinner to honor the Gael and Grand Marshal. Dinner, drinks, and dancing provided. The 35th annual St. Patrick’s Day parade steps off at noon at Clinton Square and heads south along Salina Street following that green stripe– convenient, huh? Now this is Syracuse’s biggest and most boisterous event- it’s a BFD. In fact, the Syracuse St. Patrick’s Day parade has been compared to the Mardi Gras parade in New Orleans. We’re talking bagpipers, Irish dancers, fire departments, marching bands, floats. The whole shebang. And word along the green line is – this year’s parade may have a special, seasonal guest joining the procession. Wink. If you don’t feel like standing outside with all that Irish action in your face, watch the parade from inside the Sky Armory. Throughout the day they’ll have live music, performances by Irish dance schools, and a family-friendly party on the second floor with Leprechaun games and cookie decorating for the wee ones. 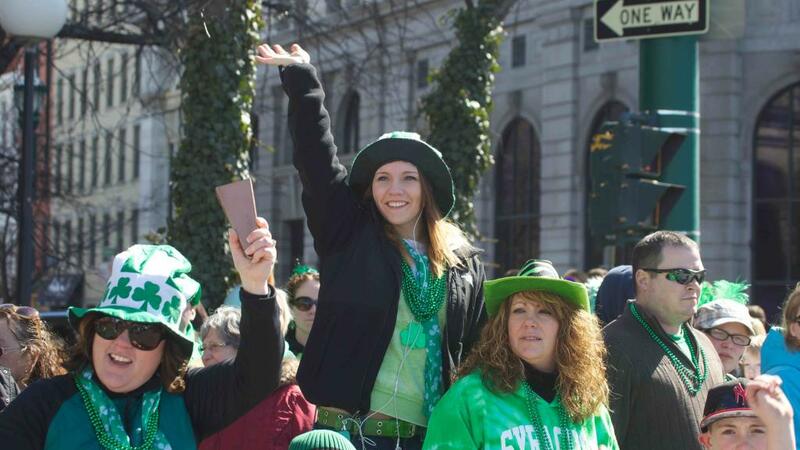 Once the streets have cleared and the confetti has fallen, you can either head to one of the local, Irish pubs, or make your way to the St. Patrick’s Post-Parade Party (say that 3 times fast) at the Marriott Syracuse Downtown. The shenanigans continue at the historic hotel with, Irish step-dancers, a buffet, and plenty Irish beer, whiskey, and a special Irish Mule cocktail. Rock out with Irish Folk Rockers, The High Kings. 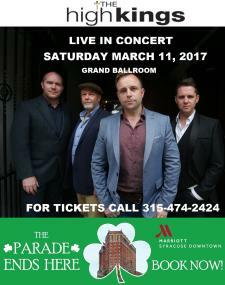 The High Kings appearance in Syracuse comes between sold out shows in Chicago and New York City, and prior to a prolonged tour of their native Ireland and Europe. You didn’t think the city would forget March 17th, did you? Every year at midnight, as St. Patrick’s Day creeps into existence, hundreds of people gather at Tipp Hill to watch as a shamrock is painted on the ground beneath the green-over-red traffic light. I’ve heard there’s even bagpipers, but the event is BYOB- bring your own bagpipes. Insider note: Syracuse is home to the only traffic light where the green light sits above the red. Really. It’s at Tipperary Hill - on the corner of Milton and Tompkins. When the traffic light was installed back in 1925 – with green on the bottom and red on the top – the Irish community viewed it as England’s red over Ireland’s green. Locals threw stones to break the red light (no matter how many times it was fixed) until the city finally relented and put up the nation’s only traffic light with a green light on top. Then shack up at Coleman’s Authentic Irish Pub for your shamrock fix. They’ll be serving breakfast from 7-10 a.m. with 93Qs Ted & Amy, and hosting live bands throughout the day. Leprechaun door included.